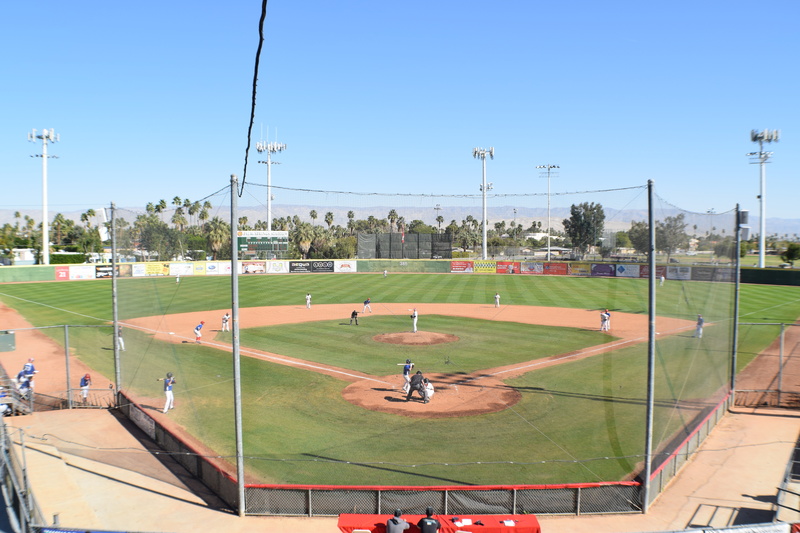 PALM SPRINGS, Calif. – Game one of two at Palm Springs Stadium ended in a 5-2 final, as the Manitoba North Stars defeated the Palm Springs Power Monday morning. The North Stars (5-3-1) jumped on Power (6-3) starter Noe Arteaga (1-1) in the first inning. With one out, Adrian Guzman walked and Cory Slater followed with a single. David Kerian, with two outs, launched a three-run home run to deep left field to lift Manitoba to an early 3-0 lead. That was more than enough run support for North Stars starter Jensen Kirch (1-1), who allowed two runs (one earned) on one hit while striking out five and walking two in five innings pitched. So far, Jensen boasts a 1.07 ERA with 12 strikeouts compared to five walks in 13 total innings and he plans to continue that type of success. “I’m going to keep trying to do well,” Kirch said. “My off-speed stuff has really worked well out here. You get a lot of aggressive batters and it seems my breaking stuff is keeping guys off balanced. Manitoba added two runs to their lead in the fourth, as Graham Wick reached on an error and scored on a Will Krug sacrifice fly. Alex Liquori also reached in the inning and later scored on a wild pitch. A mistake from Kirch in the fifth inning was sent out of the ballpark by the Power’s Scott Hilpert. Phillip Mandt followed with a walk and ultimately scored on an error to cut the deficit to 5-2. 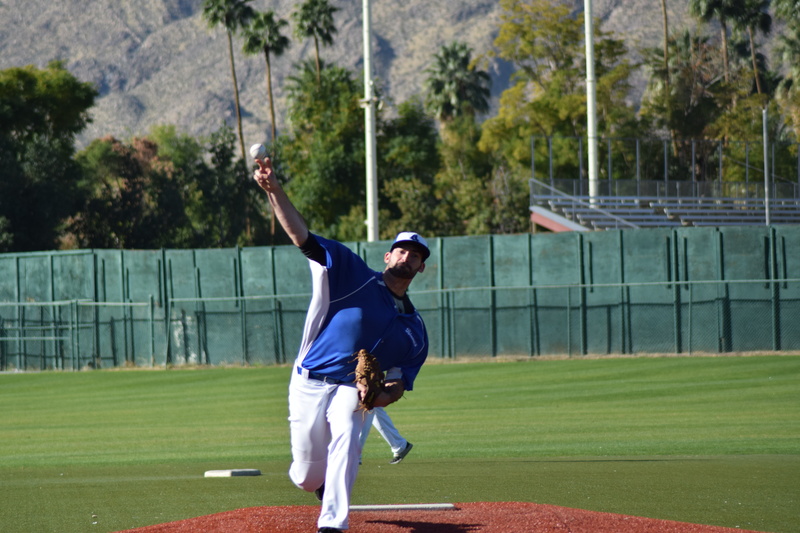 David Meade earned the save after striking out the side. Krug finished his day 2-for-3 with an RBI and a stolen base. 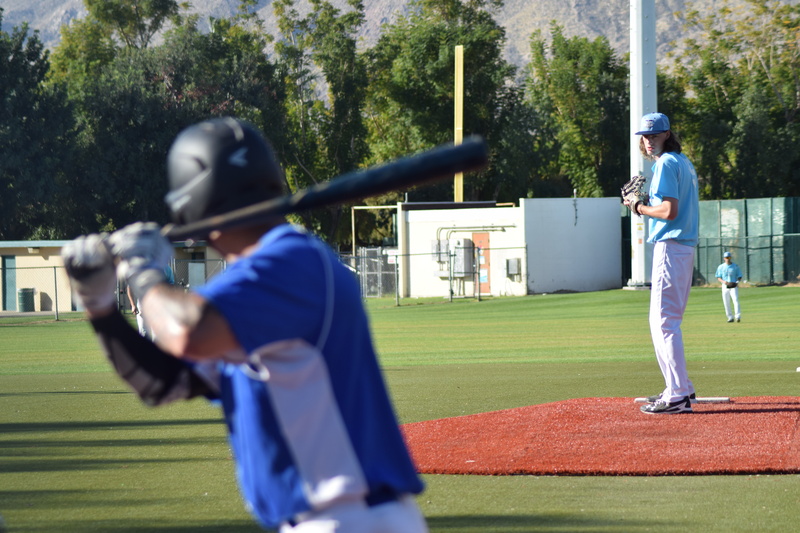 The second game of the day featured the British Columbia Bombers and the Palm Springs Chill, which ended in a 3-3 tie. The Chill (3-5-1) led 3-2 in the top of the seventh with the Bombers up to bat. The Bombers (2-5-2) had a man on second and no outs when the game was called because Chill pitcher Brandon Warner tweaked a leg muscle on the mound. The Chill did not have another pitcher available in the game, so both managers agreed to end the contest there and call it a tie. The first inning featured almost all of the scoring in this one. The Bombers jumped out to a 1-0 lead on Chill starter Tyler Matzek on Skylar Mercado’s RBI double to left-center field. 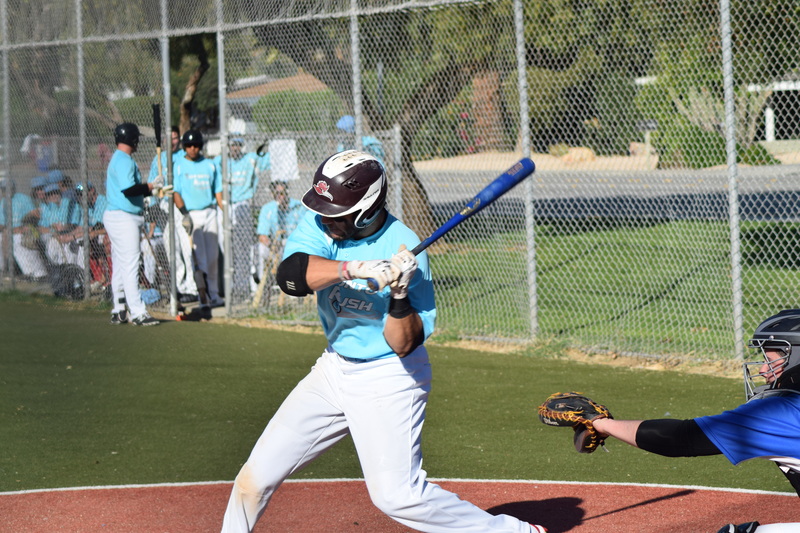 The Chill answered with three runs in the bottom of the inning on Zach Nehrir’s three-run home run over the left field fence. The Bombers got another run in the fifth on a Mercado RBI single and were threatening to tie the game or take the lead in the seventh when the game was called and officially scored as a tie. 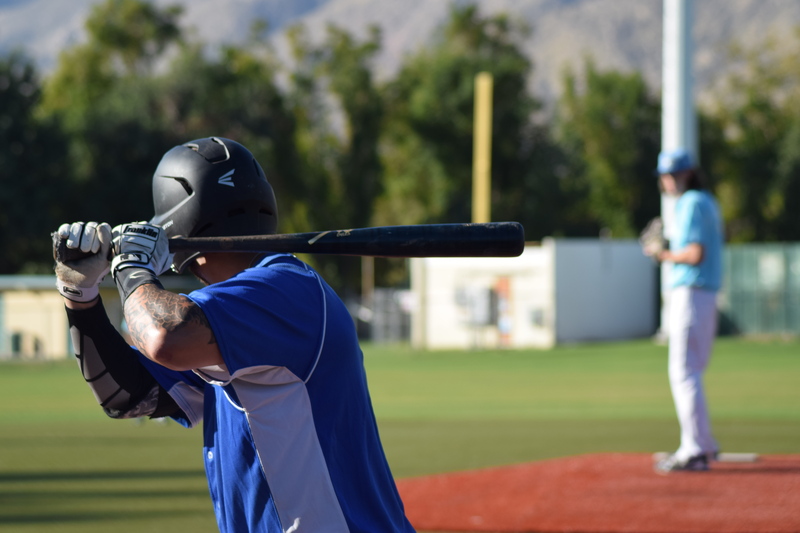 Game one on the auxiliary field featured the Washington Blue Sox (7-3) taking down the Toronto Rush (4-5), 3-1. Ryuji Sugimoto, Kailer Smith and Scott Stetson each recorded an RBI for Washington. Nick Landell went 1-for-2 for Toronto with an RBI. Joseph Costello (3-0) earned the win after allowing one unearned run on two hits, while striking out eight and walking none. The tough luck loser was Walter Rook (0-2), who allowed three unearned runs in six innings. In game two on the auxiliary field, the Alberta Grizzly (4-4-1) defeated the Canada A’s (6-3) 4-0. Louis Cohen (1-0) got the win after a stellar outing in which he allowed one hit, no runs with seven strikeouts and one walk. Thomas Goodyear (1-1) was handed the loss. 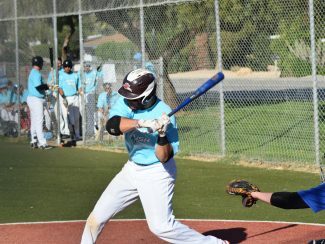 Sam Krick homered and drove in three RBI for the Grizzly. Carter Grote and Tyler Post recorded the only two hits in the contest for Canada. 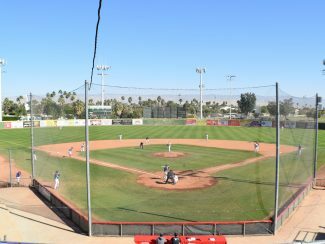 Tuesday, February 6 will be “Two-for-Tuesday” at Palm Springs Stadium. Two fans will be admitted for the price of one ticket. Also, hot dogs and sodas are priced at $2. 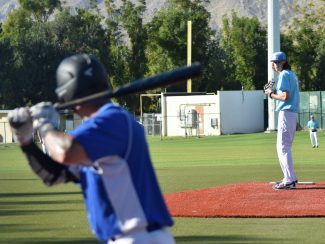 The first game on Tuesday features the Coachella Valley Snowbirds taking on the Oregon LumberJacks beginning at 10:00am. Game two will see the Alberta Grizzly take on the British Columbia Bombers at 12:30pm. 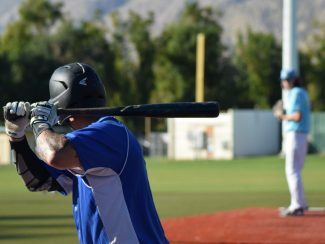 Fans can listen to the broadcast live at CaliforniaWinterLeague.com.